Everyone loves this book but me. 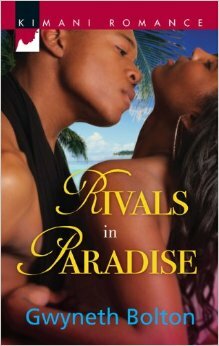 Gwyneth Bolton‘s Rivals in Paradise is a highly rated Enemies-To-Lovers tale that I DNF’d at 22%. Cicely and Chase were college rivals jockeying for social position at the same small school. I’m pretty sure that he’s part of the reason for the terrible day Cicely is having at work when we meet her. After failing to get an expected promotion she walks in on her man cheating in her own bed. Canceling a planned family trip for Thanksgiving, Cicely instead books a flight for the island of Dahinda. It’s apparently tropical, but I’m not familiar with it. (There’s a Dahinda in Ontario and Illinois but they’re snowy.) Chase is on edge after taking a new job (Hmmmmm) that he already regrets. He’s flying home to see family when who should be seated next to him in first class but his long lost nemesis. It was on the plane that Rivals in Paradise shifted from neutral to oh-hell-no. Chase and Cicely act like high schoolers instead of professional adults. Perhaps it’s my lack of college attendance and failure to join a sorority, but reading about the basis for their anger made me… angry. Is this a real thing? Like, is this set up even possible? Bolton describes a world where historically sibling groups are so alienated on campus that new sorority members are instructed to give the silent treatment to any fraternity member. Ignore them if they speak. Walk around them and don’t make eye contact. Pretend they don’t exist in class. Are they toddlers? Why would you join a group with such requirements? Is this a cultural thing that’s eluding me? How did people keep reading this book???? Like, what?? Chase tells Cicely he wants to bury the college hatchet. She agrees, while thinking his back would be the best place for it. Accusations of election fraud and slander fly behind tight smiles and congenial words as both lose themselves in info dumping thoughts Bolton is prone to info dumping via personal reflections. During a phone call with her sister Cicely has multiple musings about the state of Latonya’s marriage. It’s ups, it’s downs, it’s reunions, it’s… take this one. That’s the third or fourth explanation in three pages. Prior to that we learned Carlton is rich, his grandmother interferes in the marriage, Latonya’s grandmother is beloved, Latonya has Daddy Issues, she doesn’t trust happy endings, etc. The girl just wants her sister to come on the damn holiday trip. We don’t need to know any of this. None of this is relevant. It’s a basket of WTF pretending to be character depth. Rivals in Paradise exceeded my why-is-this-happening meter by a mile. If you’re one of the (many) 5 star reviewers, tell me what I missed because I DNF’d it so hard before Chase and Cicely got off the plane.